© Copyright is vested in the Association and, in relation to each article, in its author, 2014. The overwhelming majority of defendants in Australian criminal courts plead guilty and most Australian jurisdictions include a guilty plea in their sentencing legislation as a mitigating factor. However, the application of this reduction varies significantly. In an attempt to provide a better understanding of this aspect of sentencing, this article examines the legislation and case law on guilty pleas, with a particular focus on the Australian Capital Territory. The article contextualises this discussion by examining the High Court’s position on sentence reductions for guilty pleas, as well as the New South Wales Court of Criminal Appeal’s guideline judgment in R v Thomson; R v Houlton (2000) 49 NSWLR 383. Recent key legislative amendments in relation to quantifying guilty pleas are then discussed, revealing the often subtle but meaningful differences in the legislation across Australia. 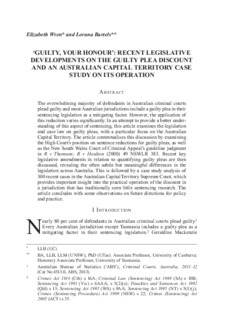 This is followed by a case study analysis of 300 recent cases in the Australian Capital Territory Supreme Court, which provides important insight into the practical operation of the discount in a jurisdiction that has traditionally seen little sentencing research. The article concludes with some observations on future directions for policy and practice.